POCKET PRO AND POCKET PRO+ TESTERS Take the Guesswork Out of Your Measurements. Applications • Beverage • Field Use • Industrial Water • Power • Wastewater • Swimming Pool / Spa Water Pocket Pro and Pocket Pro+ testers measure electrochemical parameters in a broad range of water applications. 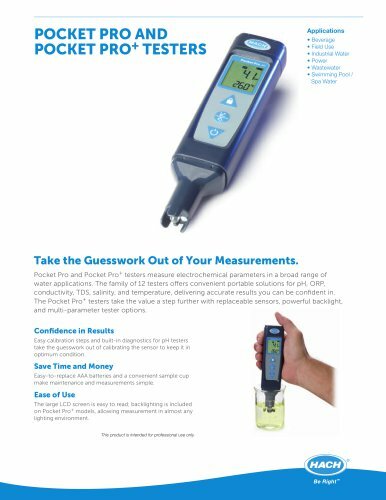 The family of 12 testers offers convenient portable solutions for pH, ORP, conductivity, TDS, salinity, and temperature, delivering accurate results you can be condent in. The Pocket Pro+ testers take the value a step further with replaceable sensors, powerful backlight, and multi-parameter tester options. Easy calibration steps and built-in diagnostics for pH testers take the guesswork out of calibrating the sensor to keep it in optimum condition. Save Time and Money Easy-to-replace AAA batteries and a convenient sample cup make maintenance and measurements simple. The large LCD screen is easy to read; backlighting is included on Pocket Pro+ models, allowing measurement in almost any lighting environment. This product is intended for professional use only.